Our semi-rigid duct naturally retains its corrugation form and is resistant to sagging when extended. 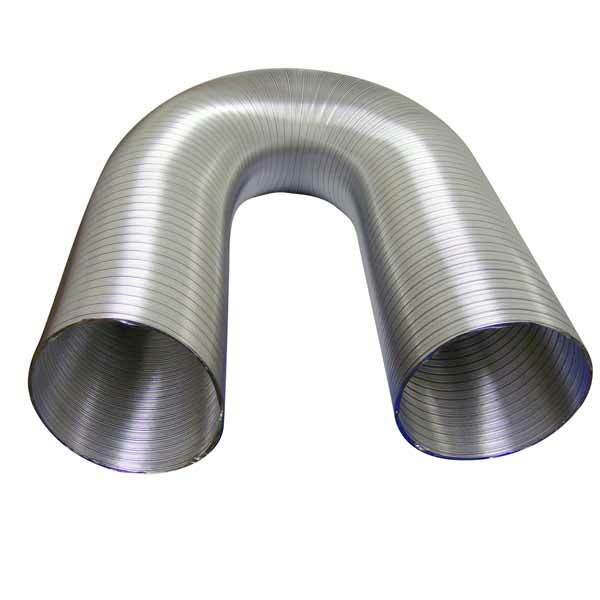 50mm semi-rigid flexible ducting - aluminium. Our semi-rigid flexibles ducts are shipped in a compressed state for ease of delivery. 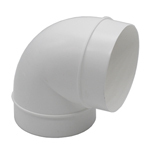 NB Please note that the 50mm semi-rigid flexible ducting is usually made to order. Therefore please allow 7 to 10 days for delivery. If your requirement is time sensitive, please contact our sales department on 08456 44 6001 to confirm availability. GALALI - Tecflex 500 is a pure aluminium duct of laminated construction allowing flexibility in both axial and lateral planes. 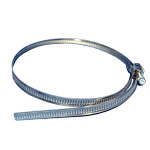 Bends can be formed by hand, making it an ideal solution for final connections. GALALI - Tecflex 500 is manufactured from a corrugated strip spirally wound to produce a tube with a double overlapped joint which is crimped by a unique patented process to ensure pressure tightness up to 2500 Pa. and prevent uncoiling in use. The corrugated depth is designed to combine maximum flexibility with resistance to physical damage under site conditions. The extra deep corrugations of GALALI - Tecflex 500 bring metal tubes into a new field of flexibility. All sizes from 75mm to 500mm can be formed by hand to a 1 2D radius - a feature only previously thought possible with fabric type flexible ducting. GALALI - Tecflex 500 can also be extended or compressed for installation between spigots located opposite each other. GALALI - Tecflex 500 naturally retains its corrugation form and in doing so achieves maximum distance between supports without "sagging". GALALI - Tecflex 500 retains its cross section regardless of state; it can be compressed, extended or formed into bends or offsets with no reduction in area. This means that frictional resistance figures are constant and airflow figures can be accurately predicted at the design stage. 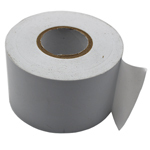 Each 3 metre length of duct is individually packed and labelled in its compressed state. This packing configuration ensures that the chance of damage in transit or on site is reduced to the absolute minimum. GALALI - Tecflex 500 has been tested to BS476 parts 6, 7 and 20 and meets the requirements of CP413 section A2.2.3. (Ducts for Building Services) and is suitable for use throughout the U.K. When tested to BS476 part 7 a class 1 spread of flame was recorded. When tested under the conditions laid down in BS476 part 20 GALALI - Tecflex 500 maintained its integrity for in excess of 15 minutes. Since GALALI - Tecflex 500 is of all metal construction, smoke generation is negligible. Cut GALALI - Tecflex 500 in its compressed state to the required length (ducting extends to approximately 4 times its compressed length) using a sharp knife. We recommend that joints be sealed on medium and high pressure applications using Tecseal, Tectape heat shrink tape or the XT Sealing System. To fix GALALI - Tecflex 500 use Tecfix banding or clips. Working Pressure - Maximum 2500 Pa positive. 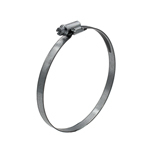 Inner and outer diameter + is it flexible at the opening? Hi, I was wondering if you could clarify the inner and outer diameters of the ducting. I am looking for something at least 50mm to fit over the opening of my leaf blower, hopefully the opening is also flexible to allow a snug fit. Thank you in advance for your help.